What was Christianity on numerous occasions referred to in the Bible? The beginnings of potentially prolonged and disastrous droughts are already here. WORLDWIDE, governments and weather officials are alarmed. They warn that if drought continues just one more year over large areas of North America, Africa and other continents, scores of millions will experience severe shortages in water and food supplies. Despite periodic rain, drought of worldwide dimensions has affected, to one degree or other, some heavily populated and agriculturally critical areas. Drought-pocked Americas; In North America, meteorologists say something potentially disastrous could be happening to weather patterns. The weather of the North American continent in the 1980s seems to be stuck in a pattern that has been more often dry than wet. 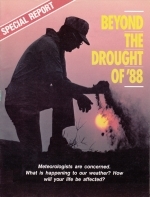 A look back at weather records since 1980 shows only 1982 when there were no serious drought areas.